10x8 negative photographed by James Burton August 22, 1903. 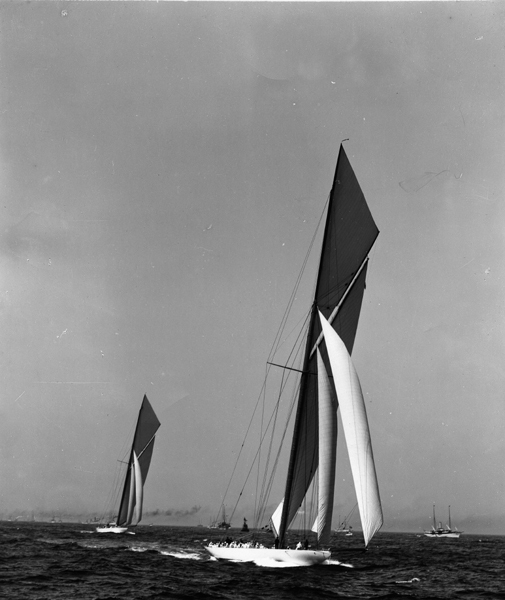 Image of RELIANCE, #G16, leading SHAMROCK III, starboard bow view, just prior to the firing of the preparatory gun to notify contestants to get in position for the start gun for the first America's Cup race on New York Bay, New York. Handwritten neg. sleeve info. : "B-926 / Aug. 22- 03 / Reliance leading Shamrock III / pg. 138". Handwritten on side margin on emulsion side of neg. : "Ready for preparatory gun, Aug 22" and "Aug 22 1903" and bottom corners, "926" and "5". CREDIT LINE: Mystic Seaport, Rosenfeld Collection, James Burton photographer.